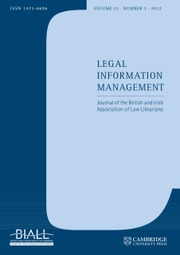 Aimed at professionals active in the legal information community this topical journal provides invaluable information for all those involved in the provision of legal information in the academic and professional environments. Published quarterly, and with an extensive current awareness section, a regular international developments column and coverage of management issues, Legal Information Management is the international journal for legal information professionals everywhere. Agile Working, the Entreployee and Generational Issues: Brave New World or Still Business as Usual at the Office? How Can Law Librarians Most Effectively Provide Legal Research Training?